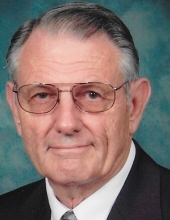 Mr. Daniel Wayne Lady, U.S. Army Veteran and resident of Hereford, Texas, passed away Saturday, April 13 at the age of 84. Mr. Lady was born April 20, 1934 in Deaf Smith County, Texas to Cecil and Pauline (Fincher) Lady. He graduated from Hereford High School in 1952 and from West Texas State College (now West Texas A & M University) in 1957. He and Betty Buse were married May 21, 1957 in Hereford, Texas. He spent his active duty in the United States Army in Germany. After returning to the States, he and Betty lived in Amarillo, Texas until moving to Abilene, Texas January 1st, 1961. He received his Honorable Discharge from the Army on the 31st day of March 1963. The couple had adopted Cynthia and Brian by then, and the family moved back to Hereford, Texas in late 1966. Daughter Alison came along on September 6, 1967. Wayne worked 24 years at the Deaf Smith Electric Coop as Office Manager and Accountant until his retirement in 2005. Wayne’s hobby was cutting and assembling wood craft items for Betty to paint and decorate. They traveled together to arts and crafts shows in Arkansas, Oklahoma, and Missouri with the items they’d produced together. Mr. Lady is preceded in death by his wife Betty, his parents, and by one great-grandchild. He is survived by his brother Jim Lady and wife Janice of Sweet Home, Oregon and by his three children: Cynthia Lady of Shongaloo, Louisiana, Brian Lady of Eden, Texas, and Alison Lady of Hereford, Texas. He also leaves behind six grandchildren: Jossalyn Walden-McDaniel, Jackie Humphries, Bob McClure, Jacob Lady, Brandi Ramirez, and Britni Esqueda and nine great-grandchildren, as well as numerous nieces, nephews, cousins, and friends all of whom love and will miss him greatly. The family requests that memorial donations be made to Hereford Senior Citizen Center, King’s Manor Retirement Center, First Baptist Church of Hereford, or to the charity of your choice. Rev. Jacob Larra presiding. Military Honor Guard provided by Volleys for Veterans. "Email Address" would like to share the life celebration of Daniel Wayne Lady. Click on the "link" to go to share a favorite memory or leave a condolence message for the family.